Chloe Hardwick, the heroine in Unbuttoning Miss Hardwick, is a model of efficiency and organization. (You did realize that writers get to explore all sorts of fantasies in their books, right?) It’s a skill set that serves her well in her role as assistant to Lord Marland, the Marauding Marquess. It makes her invaluable as they work to build a magnificent setting for his collection of ancient weapons. But when her growing feelings–and his lack of the same–make it impossible for her to stay in her position, her skills earn her a spot with his sister as the Countess of Ashton plans the biggest event of the London Season. Undertaking an entertainment like this is no small matter in the Regency. In the 18th and 19th centuries having people to dinner was a formal affair and a chance for a hostess and her staff to shine. 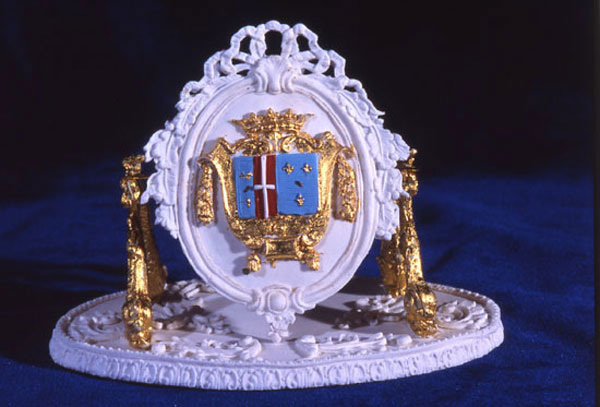 In an age when a noble family’s ordinary dinner might consist of two courses with ten dishes each, when lavish entertaining was a source of pride to a hostess and a matter of great interest to her guests, when detailed descriptions of a dinner’s components and the evening’s festivities would be recorded in multitudes of letters and journals the next day, this was a high stakes undertaking. One place that hostess wanted to shine was with her desserts. 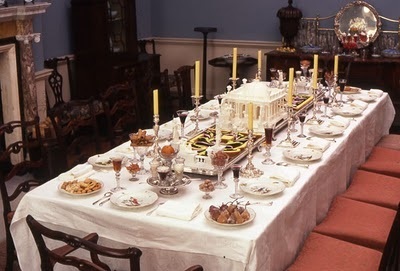 On a normal day the dessert course might consist only of fruit, nuts and cheeses, but for a grand occasion it might be the most expensive and elaborate of the evening. Often a dessert centerpiece would run down the center of the table. Occasionally the hostess would set up a separate table, a place of honor for the display. 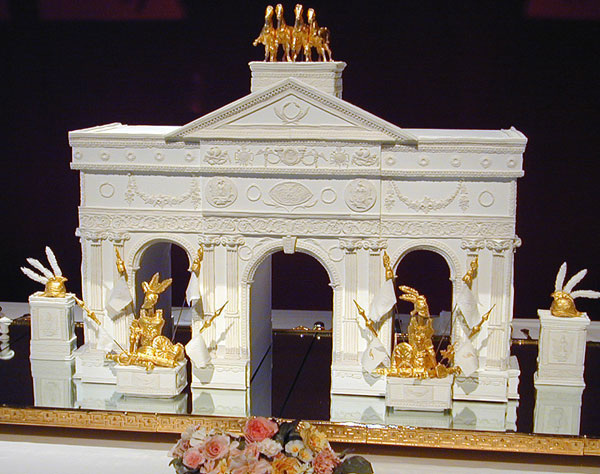 And a display it would be, decorated with sugar paste–also known as pastillage–sculptures in classical shapes. These might include architechtural arches, pavillions or pedastals. Horses, statuary and cherubs might be recreated, even hedges, flowers and garden settings. Gorgeous scenes would be assembled, often upon a mirror, which would enhance the display and the light in the room. Sugar paste could be used to create table favors for each guest, waiting at their place. 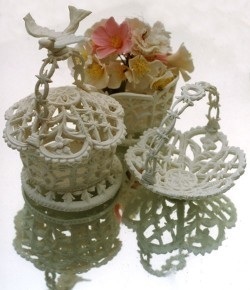 A tiny, elaborate basket filled with candies, a coat of arms, or even the place setting card might be molded into a gift for the guests to take home. 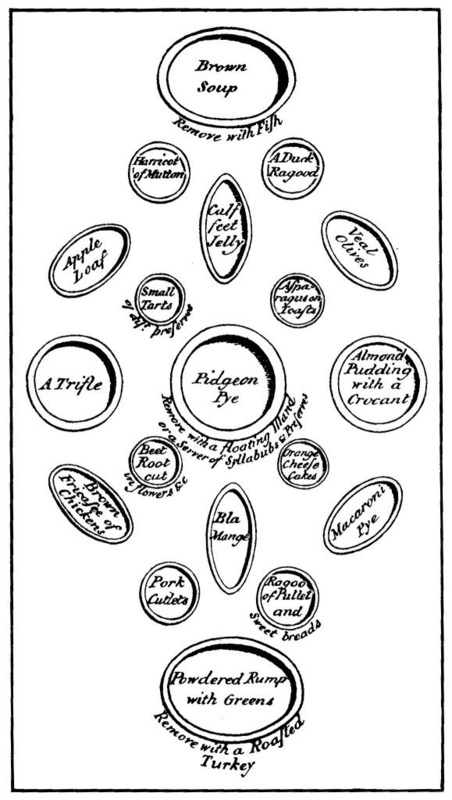 Popular desserts which graced the decorated tables were ices, of course, and creams, biscuits (cookies) and puddings. Several of the pictures above were featured on a wonderful blog called Historic Food, run by Ivan Day, food scholar, cook and confectioner, teacher and museum expert. Check it out!